National champions Tony Mace (left) and Roger Stevens with their trophy. Northants Bowling Federation have enjoyed record-breaking success at this year’s English Bowling Federation finals at Skegness. After winning the Adams Trophy inter-county championship for the first time, they won two individual titles, had three other finalists and returned home with the Victor Ludorum as the top men’s team in finals week. County president Bob Warters (Ketton) won the veterans singles, and Whittlesey Manor’s Roger Stevens and Tony Mace took the senior pairs. Parkway’s Stuart Reynolds, James Harford and Mike Robertson were beaten finalists in the two-bowl rinks; Blackstones’ Adam Warrington, Martyn Dolby and Jonathan Earl were runners-up in the three-bowl rinks, while Yaxley’s Robert Heath and Tony Belson lost in the pairs final. 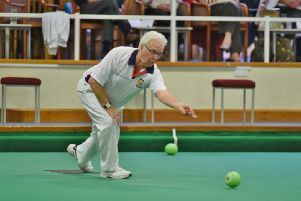 The Northants Women’s Bowling Federation had two finalists, but Sue Moir (Langtoft Pearl), in the four-bowl singles, and Parkway mother and daughter Val and Sarah Newson, in the pairs, were both beaten. Full report in Thursday’s Peterborough Telegraph.